During July 2000 a first season of excavations was conducted at ‘En Qobi (Permit No. A-3243*; map ref. NIG 2112/6258; OIG 1612/1258). The excavation, on behalf of the Antiquities Authority, was directed by D. Weiss and A. Ben-Nun, assisted by V. Essman (surveying). Additional assistance was rendered by the Jewish National Fund, G. Bashan (project director) and R. Zada (administration). The site is located at the top of the Nahal Qobi wadi channel, in the Judean Mountains. A spring, building remains, farming terraces, installations and tombs were discovered in the center of the site. The excavation was carried out in seven areas (Fig. 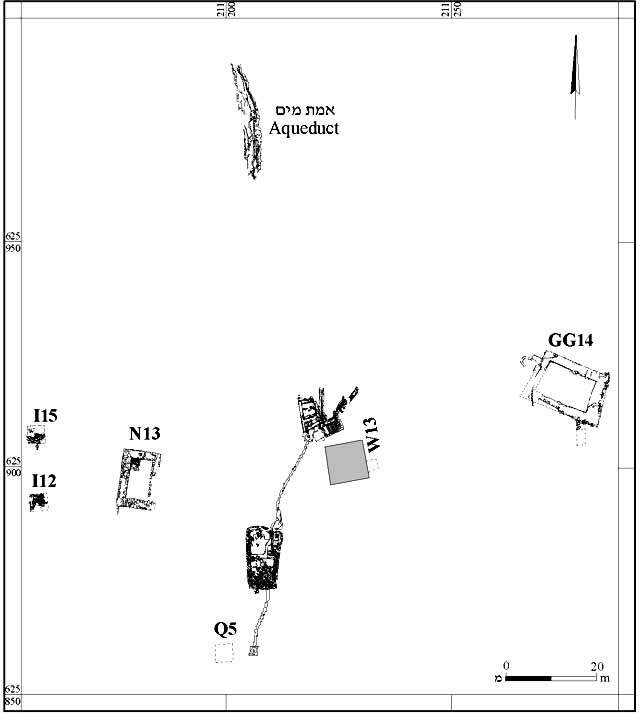 1): I12 and I15 in the western part of the site, N13 and W13 in the center, GG14 in the east, Q5 in the south and an aqueduct in the upper part of Nahal Qobi. Area I12. Three walls of a rectangular building were exposed. The first, oriented north–south (0.5 × 4.0 m, 0.7 m high), was built of large fieldstones, whose eastern side was worked. The western side of the wall was not excavated. The second, oriented east–west (1.0 × 3.9 m, height 1.1 m), was built of large fieldstones and its northern side was worked. The third wall, also oriented north–south (0.5 × 2.9 m, height 0.6 m) was built on a fill of small fieldstones and preserved three courses high. Area I15. Two wall sections that did not join to form a complete plan were exposed. One was a fieldstone-built terrace wall, oriented north–south and preserved a single course high (length 4 m, width 0.3–0.4 m). The wall was dismantled as the excavation progressed and was found to superpose an east–west wall built of ashlars in the west and of small fieldstones (0.3 × 0.4 m) in the east. White bonding material was extensively used in the construction of this wall and the remains of poorly preserved white plaster were traced on its eastern side. Remains of a stone collapse and numerous potsherds were discerned along the northern side of the wall, as well as white tesserae from the Byzantine period in their vicinity. Area N13. The western and northern walls of a building were excavated. The western wall (1.7 × 13.0 m, height 3.5 m), preserved eight courses high, was built of fieldstones whose eastern side was worked and bonding material mixed with small stones was used to stabilize it. The northern wall (1.9 × 8.2 m, height 2.7 m), built similar to the western wall, was preserved five courses high. Remains of a stone collapse, which overlaid the remains of a single-course wall, oriented east–west (size of stones 0.4 × 0.5 m), were exposed in the northwestern corner of the building. This wall abutted the western wall, although the relation between the two had not been determined. The ceramic finds from the area dated to the Byzantine period and the Middle Ages. Area W13. The area was opened near the eastern wall of the maqam, dedicated to Sheikh Ahmed al-‘Omri, which is located in the middle of the site (8.4–8.6 × 8.7 m, max. height 2.4 m). The lower part of the maqam was built of roughly hewn stones and fieldstones (0.3 × 0.4 m). No diagnostic potsherds were recovered. Area GG14. A probe trench, south of and perpendicular to a wall (1.8 × 15.0 m, height 2.5 m) that survived from a building, was excavated. The base of the wall was meticulously built of fine quality ashlar stones (0.4 × 0.7 m) and founded on bedrock. It consisted of two foundation courses and four courses of the superstructure. North of the wall and parallel to it were sections of another wall that was not excavated. These were built of ashlar stones with bonding material and preserved 18 courses high. The inside face of this wall was coated with fine-quality plaster that bore the remains of a painted decoration. The western wall of the building partly survived to a height of three courses. The three walls probably belonged to a rectangular building that was not excavated. Area Q5. The excavation was suspended due to the absence of ancient remains or finds. Aqueduct. The aqueduct, located to the north of the ruin’s center, was fed by the adjacent spring. The connection between the spring and the aqueduct had disappeared when the dirt road was constructed. This section of the aqueduct (length c. 300 m) was exposed over c. 30 m during the excavation. The aqueduct (depth 0.15–0.40 m; width 0.2–0.4 m) is hewn in the western bank of the Nahal Qobi. Exists to facilitate the irrigation of agricultural areas were hewn at set intervals (2.5–3.5 m) in its eastern side. A rock-hewn staircase (2.5 m high), to the north of the aqueduct and next to the bedrock cliff into which it was hewn, consisted of eight shallow steps (0.4 × 0.6 m; length of tread 0.3 m). Ceramic finds from the Roman and Byzantine periods were recovered from the entire excavation area, while pottery from the Middle Ages came only from Area N13. 1. The site and excavation areas, plan.